“Cars I have waxed” album posted at flicker.com . How I got a new MacBook Pro, broke it, and got a new one. Then what I like and don’t like about the new MacBook Pro. Belkin FireWire 800/400 cable, Sonnet ExpressCard/34 Firewire & USB adapter, and Sonnet FireWire 400/800 Adapter. 2 iPhone Apps: WritingPad and HP11C Scientific RPN Calculator. In Dumb Question Corner we solve an iPOd episode ordering problem, and whether it’s ok to keep your iPod plugged into the cigarette lighter when starting the car. Google Groups solves a problem but unimpressed by the documents leave me cold. Help learn more about Earthquakes at qcn.stanford.edu/. In Chit Chat Across the Pond we answer a NoScript question and hear how the iPHone 3G works in Ireland. Today is Sunday October 19th, 2008, and this is show number 174. I know, there’s all these new Mac laptops to talk about, but first I wanted to tell you something MUCH more important. I finally posted my “cars I have waxed” album on flickr! I know you’ve all been waiting for that! I put a link in the shownotes so you can scamper off and see them right away! So I’m sure you’ve all heard by now how Apple announced new notebooks, MAJOR updates to both the Macbook and the Macbook Pro. You also probably know that I’ve been dying to get a new MBP, right? Oddly the 2GHz Intel Core Duo MBP I bought coming up on 3 years ago works fine, but I drive the poor thing hard! think about taking a 3 year old machine and recording audio in GarageBand…while streaming video and audio over the internet at the same time! Poor little thing, gets pretty hot and toasty while doing all that. So you can imagine my excitement when Steve said on Tuesday that they’d be in the stores on Wednesday. Our local Apple store opens at 10, so at about, what was it, 10:01 I called them. Nothing yet. Hmmm…12 o’clock? nuthin’. 5 o’clock? YES! So I jumped in my car as soon as I got out of work and raced over there and bought one! Now lest you think I decided in haste, I did spend 24 whole hours discussing with my Mac friends which one I should buy. Clearly a Pro not a MacBook, but of the Pro’s, should I get the 2.4GHz or the 2.53? I’ve always been a “buy the middle” kind of person, but now he gave me 3 choices, not 2. I knew if I bought the lower end one for $2000 I’d have to pump the memory up to 4GB from 2, and I’d have to bump the internal drive from 250GB to 320, so I ran the price comparison and that made the 2 models still $200 apart. Hmmm…must study differences. I discovered that for that extra $200, you get double the L2 cache from 3MB to 6, and double the video RAM from 256MB to 512MB. I had no idea if these were with it, but I asked both Victor Cajiao and David Sparks and without missing a beat they said I NEEDED that extra cache and video ram. You know I wanted that to be the answer anyway, and I still don’t understand exactly why I need those features, but they talked me into it. So I raced home, unpacked it and played around with it all nite. Didn’t want to do too much until I’d moved all my data and programs over, so that night before I went to bed I got ready to transfer all the data from my old MBP. First problem – the new MBP doesn’t have Firewire 400, it’s only got 800, and I didn’t have an adapter! shoot. Then I found out you could use a network cable to do the transfer. Cool, 100 mbits/sec instead of 400 but I’ll just let it run all night. I had 212GB to transfer, at 400mbits/second that should have taken 1.63 hours, or at 100mbits/sec it should be 6.5 hours. I know those are theoretical limits, but in this case it’s not like there’s a router or anything in between, I would think it would hit pretty close to that limit. Well, when I got up in the morning, it said 19 hours and 16 min left to go, which is what it said when I went to bed! It had only transferred around 10% of the data too. Argh. I heard later from listener Ryan that Apple published a fix for this problem the afternoon after I tried this. Bummer. Well, back to the Apple store. I told the guys in there that from now on they should say “do you want fries with that?” when you buy the MacBook Pro, meaning they should ask “do you need any adapter cables because Steve changed the connectors yet again?” Oh yeah, I had to get a Display Port adapter too so I could connect my cruddy old VGA display to the new Mac too. Thursday i had a telecon for work that was early in the morning, so I set up my work laptop on my desk, along with my old MacBook Pro and my new Macbook Pro so I could start transferring the data from the old to the new. As you can imagine, I didn’t have much desk space left with all those laptops and an external monitor. When it came time to do the telecon, I decided to use my Blueant Supertooth Light, which is a bluetooth speaker designed to go in your car. It’s a GREAT speakerphone. So I started my call and needed a place to set the Blueant down, and I gently set it down on the right hand side of the new MacBook Pro. So imagine my dismay when I heard for the THIRD time in six months that deadly tick tick tick that means a disk drive is failing! What the HECK???? I grabbed the Blueant but suddenly it seemed to weigh more than it did when I set it down. What the HECK??? as I pulled it off, I suddenly remembered that the blueant comes with a handy visor clip that it sticks to…I’m sure you’ve guessed by now…with MAGNETS!!!! Big strong magnets. yes, i fried my brand new MacBook Pro. the good news is that I brought it back and confessed everything and they gave me a new one! I couldn’t believe it. They simply took mercy on me. I think there’s a moral lesson here too – I was encouraged by a few friends of mine that I should just act all innocent and say “I don’t know, it just won’t boot!” I could have gotten away with that for sure, but how would I have felt about myself? It just didn’t seem right to me. No matter how much I didn’t want to go buy a new drive, it WAS my fault, and so shouldn’t I have to pay the penalty? Instead, I went hat in hand and told the Apple store what I did and they took care of me. I’m not saying it would have worked for everyone, but I think honesty paid off here, and I still could have lived with it if I had had to buy the new drive, wouldn’t have been mad at Apple at all. I promise I won’t talk about the new computer for the ENTIRE show but I do want to talk through some things I like and dislike. By the way, when I got the 2nd new computer, it didn’t take 1.67 hours to transfer the 212GB over FireWire 800, it took SIX HOURS to do it. I would REALLY like someone to explain to me why they even give us those numbers if they are off by a factor of three and a half under nearly ideal conditions! I put links in the shownotes to a couple of options for the Firewire 400/800 issue. The first is the Belkin cable with 800 on one end and 400 on the other, for around $22 at Amazon (or you can pay $30 at Apple like I did or $40 direct from Belkin). The next option is a lot more expensive but a bit slicker – it’s an ExpressCard/34 slot card that gives you two firewire 400 jacks AND an extra USB 2.0 connector for $49. Finally I put in a link for the Sonnet Firewire 400 to 800 Adapter which is probably the best option. It runs $17.50 at Amazon and it has a male FireWire 800 plug you put in your new machine, the other end is a female Firewire 400 connector for your standard FW cable. Now let’s talk about what I like and don’t like. Remember I’m coming from the oldest Intel-based Mac when you hear my thoughts here. AMAZING display – TOO bright, believe it or not. I think people who are worried about the glare (and rabidly upset about it) should look at this display outside in broad daylight – unbelievable. Backlit keyboard – more dramatic with the chicklet keys – lights all around. Cosmetic, I don’t really use the backlit keys that much, always had them. Magnetic closure is very pleasing, no latches! Energy Saver iCon – in light of their commitment to “green”, they’ve changed the energy saver icon to a compact fluorescent bulb! Different – I was kind of disappointed that the first gen MacBook Pros looked EXACTLY like the G4 Powerbooks – for that much money I wanted soemthing that LOOKED different – well now I got it! Black keys, the black glass bezel around the display, the roundy corners, all fun. Easy disk access – LOVE THIS!!! Not that I want to put Pat Dengler out of business, but it’s so nice that with this model, you slide a lever, and remove the bottom panel and you can see the battery and the disk drive. Could not be easier – I thought the old MacBooks were easy, this is even easier! Graphics – new MBPs have 2 graphics cards – the NVidia 9400M with shared memory with the CPU, and the 9600M GT for TURBO BOOST which has it’s own memory, either 256MB or 512MB depending on which model you buy. Not sure how to test the faster graphics yet but I expect I’ll enjoy it Don McAllister said I’d notice it with apps like Pixelmator that use the Graphics processor (or GPU) to render things like gaussian blurs and sharpness. I’ll be curious to see if Photoshop Elements and Aperture take advantage of it, I sure hope so!Don’t like that I have to log in and out again to get it to switch, and it’s buried in the weirdest place – it’s a switch in the Energy Saver control panel that simply says “better battery life or faster performance”. Glass Trackpad – Thought this would be weird with no button but it’s actually the ENTIRE trackpad that IS the button (think The Matrix, “there is no spoon”). Almost the entire thing depresses except for about the top 1″. You can assign the right click to the bottom left or bottom right so it’s all good. sharp corner on the edge – hurts my little wrist, old one had a rubber gasket around it. not a LOT thinner – my old one (first gen MBP) was 1.0 inches thick, now 0.95. but the curviness is nice! Speed – looking for crazy fast, but not sure I’m seeing it yet. Levelator did scream on a file for me, but Garageband export and normalizing wasn’t blow my socks off impressive. A couple of things are instantaneous now that were just long enough to irritate before, like running RapidoWrite – it used to take about 5 seconds to save when I put in a new shortcut, but now it’s basically in the blink of an eye. Battery insertion – the battery is HUGE, like 7 or 8 inches long, and very tricky to get back in, I ripped the plastic tab out of it straight away trying to jimmy it into position. Apple guy (Spencer) told me he’d done the same thing to one that same day. Overall I’m pretty darn happy and I think I’ll enjoy it more and more as I explore all it can do. Did I mention that I’m in LOVE with the screen? I have avoided doing iPhone apps but I have two I wanted to briefly describe. You know a lot of people hate typing on the iPhone virtual keyboard. The folks over at Shapewriter Inc have created a free app for the iPhone and iPod Touch that lets you type while sliding your finger over the keyboard instead of tapping. They call the app WritingPad, and it’s one weird piece of software, but I think I like it! It’s amazing how smart it is, seems to know about 90% of what I’m writing. Sometimes you need to teach it a new word, which you can easily do, and also if it misses a word it gives you a list across the screen of what you might have meant so you can easily just click on the right word. The one bad thing is that means you pretty much have to check at the end of every word whether it got it right, instead of powering away writing. Once you’ve written a note, you can hit the email button at the bottom and send it right over to the iPhone/Touch email program. Essentially it does a copy and paste for you which is awesome. I think the accuracy can be improved but for now and for free, I think it’s a very interesting piece of software that solves a real problem. the other application came from listener Lynn’s husband Gary, and I’m even more excited about this one – it’s an HP11C Scientific RPN Calculator! Yes! Another RPN calculator! Now this one from R.L.M. Software is my dream because it’s EXACTLY the model I’ve had since college. I still use my hP 11C calculator and I inherited my dads when he passed away, so I have one in each of my desks. This one is $9.99, which is a bit steep for the App store but since it’s a specialty item for fanatics I’m sure it will be a hit in that crowd! Thanks Gary for a great pick! I like to record a radio program that has been converted into a podcast. Usually there are 9 episodes to a single day of the radio program. The problem is that the when I transfer the episodes into my iPod, the order is last episode, first to be played. That means that if I want to listen to the episodes in order of how they were originally broadcast, they are actually ‘backwards’ on my iPod. I’ve gone to iTunes help, with no luck. I even went to the trouble of renaming in the INFO tab the track number to read ‘1 of 9’, ‘2 of 9’ and so on. I even checked the ‘part of a compilation’ box. Still, the podcast loads into my iPod as last episode first. I love this question – because I actually know the answer! Simply make a playlist? that’s how I solve the problem for long road trips where I won’t be able to fiddle with the iPod while driving. just rearrange them into the order you want and start playing the top one and it will go right down the list. I’m so excited that I was able to answer an iPod question!!! Perhaps this is the first time you’ve received a “dumb question” via Facebook? My sister told me that I should never start my car while my iPod is plugged into the power (cig. lighter). Is this true? I have an iPod Touch, not that it probably matters which one I have. why yes, Karen, you are the first to use FaceBook to submit a dumb question! what a cool idea! I thought about winging an answer to this one but then I thought, why not ask Honda Bob? Here’s what he said, “That is not so dumb a question. The fact is, power to the power outlet on most cars doesn’t get power until the engine starts anyway, so turning the switch from off to start has no effect on anything plugged into it. If anything, it looses power only momentarily.” I double checked with him that there’s no chance of a power surge, and he said, “A power surge, never. A power drop off always.” So I think that you’re safe leaving your iPod or anything else plugged into the cigarette lighter of your car. Thanks for the question Karen! Speaking of Honda Bob, we got a question from a listener on whether he works on hybrids Hondas. Lynn was wondering because he didn’t have anything up on his incredibly informative site about hybrids. Well ask and ye shall receive – Bob immediately wrote up a whole section on how the hybrid Integrated Motor Assist Vehicles work. One of the things I like about Bob’s site is that while he only will work on Hondas and Acuras, his website is very informative no matter what kind of car you have. The page on the hybrids is no exception, it’s an explanation of how the hybrid assist, walking you through the contributions from the engine, the electric motor, the powertrain computer unit, the transmission and the battery pack. Head on over to the link in the shownotes to learn more. If there are questions you’d like answered on Bob’s site, shoot him an email at hdabob@aol.com, and while you’re writing to him, schedule your next maintenance for your Honda or Acura with him! That is, of course, if you live in the LA or Orange County areas. He also accepts appointments by that time tested, but somewhat archaic method, the telephone – give him a call at (562)531-2321. HDA Bob’s Mobile Service is not affiliated with Honda, Acura or Honda Worldwide. My son is on the running team at his high school and I’ve gotten a bit involved with the parents who run the booster club. The team mom was wonderful, keeping an email list of all the 150 students and as many parents as she could muster, sending out emails about upcoming meets, who lost a sweatshirt, when to send money and what time the busses would pick up the kids. one problem though, her ISP decided she must be a spammer because of these mass emails she was sending out. another problem was that 100% of the communications had to go through her. So we sat down and pumped all of those email addresses into a Google Group, which was harder than it should have been – it too kept barfing if we tried to do too many addresses at once. After enough tries we got all the names in. I’m really pleased with how this works now – if Bobby’s mom finds a sweatshirt, she can write to the whole group instead of going through the team mom over to the right kid, back to the team mom, back to Bobby’s mom. Works flawlessly and more communication is going on now than ever before. next problem to solve – we have a home meet coming up that looks like it’s going to require a great deal of parent involvement. One mom said she’d maintain the list of volunteers, so we went back and forth on the best way to do this. She had an Excel spreadsheet, which i could have exported to html and stuffed into our WordPress website (also created by moi). that’s a pain tho cuz Excel makes such dreadful html you have to do a LOT of editing to make it readable, and it’s a pain to edit, and again every parent would have to contact he and then she would have to edit online. She thought it would be much easier if we just had something in the google groups. Between the two of use we found the solution, and while it technically works it’s not quite what I want it to be. Turns out there’s a feature in google groups where you can create a document that anyone in the group can edit. It’s probably part of Google Docs, but instead of being the spreadsheet format, it’s just a word processor. Couldn’t figure out how to get a table to work in their either, so I put it in using a non-variable spaced font. You know how if you try to make a table using spaces in a normal font it never lines up right? Trying using Courier instead and every character takes up the same amount of space so the columns do line up nicely. I cut and pasted all 38 parent’s information in, made it Courier and it looked great. Every person who was a member of the group can go in and add their name and it is instantly updated. Very cool, just what I wanted! Until someone accidentally messed up the font on a couple of lines. No worries, I’ll just go back in and change it to Courier, right? Wrong! I changed it, it changed it back. i went to the source text, changed it there, it would change it back. i went back and forth messing with this stupid thing for over an hour before I beat it into submission! i have no idea why it was so lame, and how anyone can claim that Google Docs is ready for prime time. What a mess! If anyone has other suggestions on this or can explain why it did this I’d sure like to hear about it! Have you ever wished you could do something to help us understand earthquakes? Living in earthquake territory in California, this is something near and dear to my heart. 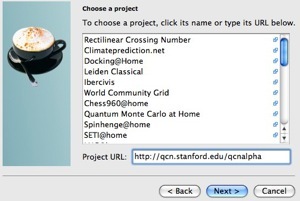 Steve told me about an effort called the Quake Catcher Network, or QCN at Stanford to use the accelerometers in Mac and Windows laptops to detect tremors in the earth. how’s that for cool? It works in a very SETI@home and folding@home kind of way – that’s the distributed processing algorithms created to harness the untapped CPU power across the world into a virtual grid computer. My friends who understand grid computing would probably yack at my lack of precision on that description, but that’s the way it goes. One thing that freaked me out – after I installed it, it asked me for my name and country I wanted to claim, which I did, and asked me for my zip code, which I chose not to give. it then took me to a web page where it identified EXACTLY where my house is on a map! Seriously! it claims it did this by IP only – is that possible? anyway, it asked me to identify some locations I go to frequently so I guess if you took your laptop to work every day you could tell it you’re there sometimes. I’ll run this for a while and see if it picks anything up – not sure if it would tell me or just them! If you want to do your part to provide data to earthquake analysts, head over to the Quake Catcher Network and get involved! I’m continuing to really enjoy using ScreenSteps to document things I know how to do on the Mac and on Windows. This tool allows you to make very professional documentation – like PDFs manuals complete with the table of contents, or HTML versions suitable for a website, and even lets you publish your lessons to your blog. Take screen snapshots, annotate with boxes, circles, arrows and even sequence steps if there’s a lot of things to do on one screenshot. Type in titles for each step, then type in all the instructions for that step, but then let ScreenSteps do all the heavy lifting of formatting the pages, wrapping text around graphics, creating page breaks, formatting section titles – you never have to worry your pretty little head about these things ever again! Once you turn into a ScreenSteps maniac like me, you’ll really appreciate the tagging function – you can tag your lessons, which makes it so easy to find the lesson you’re looking for. If you’d like to give ScreenSteps a try, but you’re not sure if you want to buy yet, no worries, there’s a 30 day free trial! I also HIGHLY recommend you watch their less than 2 minute video tutorial on how it works so you’ll “get” it right away. ScreenSteps is $40 for the standard version and $60 for the pro version. But if you enter the coupon code NOSILLA in when you buy, you get 25% off! Just click the big ScreenSteps logo in the sidebar over at podfeet.com and get started! And we talk about Bart’s first travel experience with the iPhone in Ireland – he’s a happy bunny! it’s time to call it a day, but you can head over to the MacRoundtable podcast at macroundtable.com to hear a great show. I’m afraid you WILL hear my frightening tale about frying my MacBook Pro again, but when you hear what Don McAllister did to me in post editing, you’ll enjoy it even more! We had a great discussion with Don, Victor Cajiao and David Sparks, be sure to give it a listen! If you want to send in a dumb question, record a review, complain, compliment, or just chat, shoot me an email at nosillacast@gmail.com. Be sure to follow my nonsense on twitter at twitter.com/podfeet. Thanks for listening, and stay subscribed. It was good that Bart was able to do the chit chat this week. I am so glad he loves his iPhone. Sounds like he is having a great time. Anyway, I started to use NoScript right before you talked about it last week. I heard it mentioned again on Security Now podcast, & I figured that I would check it out. I lasted a few days and shut it off. I decided to try it again, since Bart mentioned it, and I am still sticking w/ it, but I think I removed some of the “security” of it by setting it so it allows all top level domains’ scripts. I felt your pain when you said that it was annoying to view images in google search. It really does block them! I hope I didn’t remove all the security from noscripts, but I really had to, it was driving me crazy to have to allow every single site I visited. Oh and I bought Screensteps (officially!) yay!